A lead follows a path which ends either with converting the lead to an opportunity, or retiring the lead when no possibility exists of converting the lead to a sales opportunity. The lead lifecycle includes an automated process to first capture the leads, then prioritize the leads for sales engagement through a scoring and ranking process. Leads are then distributed to appropriate sales resources for further lead qualification, follow-up and conversion. Flexible lead import, customer and contact creation, and de-duplication ensure marketing lead generation efforts are optimized. For example, the lead import process checks whether leads represent new or existing customers. For new customers, data needs to be created for the lead. If the lead is an existing customer, part of the lead import process checks to ensure customer and lead information is not duplicated. Marketing departments help with the lead qualification process to ensure that only qualified leads are handed over to sales. Leads are typically ranked as Hot, Warm, or Cool. Leads are further qualified by the use of company specific standard questions to score a lead. Lead scores are numeric values typically ranging from 1 to 100, where a high score represents high quality. It is not good practice to let stale leads build up. Standardized criteria for lead qualification ensure that quality leads reach the salesperson and help maximize the conversion rate from leads to opportunities. For example, your organization has criteria and processes for ensuring that leads are either developed or retired within 30 days. When the lead age is greater than 30 days and the rank is A or B, Marketing reassigns the leads for follow-up by an internal telemarketing group. If the leads cannot be qualified or further developed to revenue opportunities, the rejected leads can be reassigned or can be retired manually. As the qualification of leads progresses into real potential prospects, assignment manager uses expression-based rules to associate one or more internal salespersons with each lead. If the lead is associated with an existing Sales Account, then assignment manager uses territory definitions to associate (typically one) internal territory with each lead. The salesperson newly assigned to the lead may be related to the lead record directly through the lead team or indirectly through a territory associated with the lead. They can view and update those leads to which they are assigned in the lead work area and can claim ownership of the lead by using the Accept Lead action. Other assigned resources can view and update the lead, but cannot make themselves the owner. As the lead is qualified further, for example, if a sales prospect changes to a sales account by adding an address, assignment manager is automatically invoked during the next automated assignment cycle. Depending on the assignment logic, the lead may be reassigned to a different territory or sales resource. If the assigned salesperson takes no action on a lead for several days, then the lead can be manually reassigned to another salesperson. Lead Assessment enables leads to be further assessed through predefined questions that help determine the likelihood of the lead being accepted by Sales. In this scenario, a salesperson named Mike begins asking the customer a series of questions created by Marketing and Sales to assess the quality of the lead. As each question is asked, Mike records the answer and the lead assessment tool automatically factors the answer into the assessment score of the lead. At the end of the call, Mike notes that the assessment lead score is high. He requests the lead be assigned to the direct sales team for that customer. If the lead score was low, then Mike could retire the lead, or if the lead needed further qualifying, he could leave it in his list of leads for follow-up at a later date. If the lead is good, but the potential revenue opportunity is less than a predetermined monetary amount, for example, twenty-five thousand dollars, then Mike can convert the lead to an opportunity that he works himself. A lead's life cycle ends either when a lead is converted to a sales opportunity, or when the lead is retired. Conversion to an opportunity stage allows the salesperson to pursue the account in the sales cycle. After establishing that the lead has potential, the salesperson converts the lead to an opportunity. Contact is established and meetings and presentations are scheduled to move the opportunity along the sales pipeline. To track the progress, contact notes are captured as interactions and associated with the contact and opportunity. As the lead progresses through its life cycle, decisions to retire the lead are based on the following. >> You cannot verify customer and lead details. >> The customer is not interested in pursuing the lead any further. ► Budget – If they have enough money to buy the product ? ► Authority – If they can make a purchase decision ? Answers to the above questions at the lead stage, a company can prioritize the leads gathered and focus on those most likely to convert to sales in the short term. These are then considered 'qualified leads'. Further definition of qualification for a lead is verification that the details provided are correct. This can be done either via automated checks on a form or, even better, by calling the person in question to confirm their details. There is debate on the advantages of more or less qualified leads. Basic leads, which could be as limited as a name and an email address, will cost as little as a tenth of the price of qualified ones, but conversion rates will be very low, and potentially even non-existent. In addition, greater investment will be required in order to convert each lead to a sale. With qualified leads, a better conversion rate is guaranteed, although the higher the cost, the better the rate required to generate a good ROI. 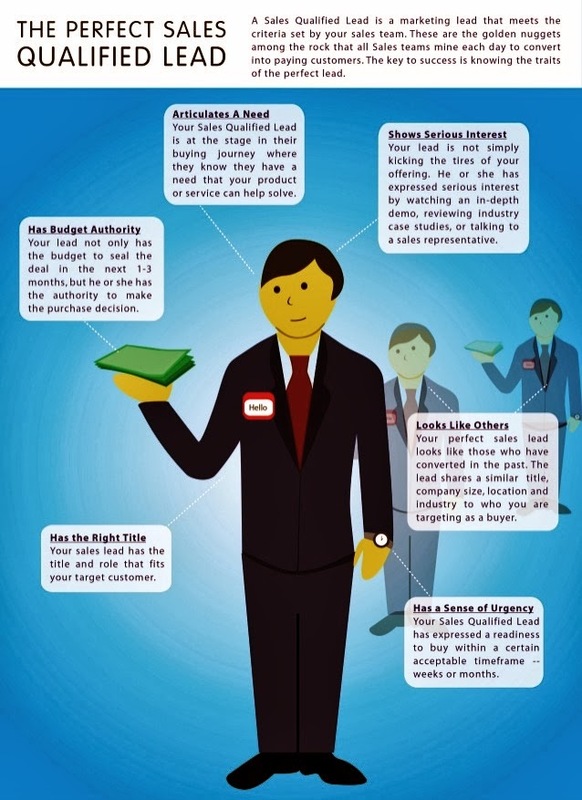 Qualified sales leads are characterized by several different variables. Most important is an expressed interest in the product or service. But that is not the only factor. The lead must also be prepared to buy offered product, and more to the point, must have the financial means to purchase it. And when searching for leads there is the factor of time: if that lead is ready to buy offered product, that means he or she could be ready to buy a similar product. The older your leads, the less likely that they are leads anymore. Nominal ranking is a process used to prioritize a long list of items, such as a SWOT analysis. Participants are given a certain number of votes that they can use and they can use these votes for any item on the list, placing numerous votes for a single item if they wish. Often participants are given "sticky dots" to place on flip charts where the list items have been gathered. Once all participants have voted, the total number of votes for each item are tallied and the highest-rating items are identified. A critical component of business plans, whether for the entire organization or for a single function--marketing or finance, for instance--is a SWOT analysis. The SWOT analysis stands for strengths, weaknesses, opportunities and threats. It involves a brainstorming process whereby planning participants identify all of the relevant factors that they are facing internally (strengths and opportunities) and externally (weaknesses and threats). The final list is then reviewed and prioritized to identify the top items under each category. These then became inputs to the development of goals, objectives, strategies and tactics. The facilitator of a planning effort plays a critical role and is responsible for ensuring that the process flows smoothly from beginning to end, that all individuals involved have an opportunity for input, that conflicts are addressed and that the work of the team--the creation of a plan--is accomplished. Team facilitation techniques include active listening, reflection, positive reinforcement and sometimes constructive feedback. All teams go through a series of predictable steps--forming, storming, norming and performing--that require different facilitation skills.